BARCELONA - Samsung Electronics said Sunday that it will showcase its new Galaxy Note 8.0 tablet at the Mobile World Congress (MWC) that starts in Barcelona, Spain, Monday. At the world’s biggest mobile trade show, the Korean technology giant will also unveil enterprise handsets and wireless solutions, two areas where it has recently shown aggressive pushes. Touting an 8-inch screen, the firm said that the latest entry into Samsung’s popular Note series also has a titular stylus. It operates on Android Jelly Bean 4.1.2, powered by a 1.6 gigahertz quad-core processor, has 2 gigabytes of RAM and supports internal memory up to 32 gigabytes and has a 4,600 milliamp hour battery. Samsung said it has also strengthened multitasking ability by supporting dual windows, where users can upload two screens at once, compared to previous tablets. It will have a liquid crystal display (LCD), not its active-matrix organic light emitting diode (AMOLED) ones reserved for flagship devices, indicating that the firm is aiming more at keeping Apple’s tablet line at arm’s length rather than increasing sales. It also indicates that Samsung wants to secure some revenue for its LCD division, which is suffering from a lack of demand against better-quality displays. The world’s largest electronics maker by revenue will also unveil enterprise phones _ the Galaxy Grand and Galaxy Express. A waterproof outdoor phone called Galaxy Xcover 2 and the design-oriented Galaxy Fame and Galaxy Young will also be displayed at the firm’s booth. It shows that Samsung is not done milking the popularity of its Galaxy series as well as boasting its massive manufacturing prowess, aimed at cementing its market share in total handset volume. It will also hold a developers’ day on Wednesday to try and enliven its currently non-existent ecosystem. Other attractions include mobile solutions and network equipment, which aim to challenge Nokia and Ericsson. 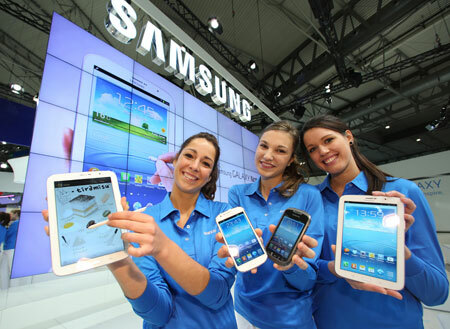 The theme of Samsung’s booth is “People Inspired Innovation” at Hall 3 of the Fira Gran Via. LG Electronics has suffered two difficult years partly because of its late entry into smartphones but aims to prove that it is still alive at the mobile trade show. It said Sunday that it will unveil a wide variety of new handsets, represented by the G, F, L and Vu series. The highlight is the 5.5-inch Optimus G Pro “phablet,” a device that blurs the line between a smartphone and a tablet, the titular phone in its high-end G series. The phablet was launched in Korea last week but will be released in other markets by the second half of the year. 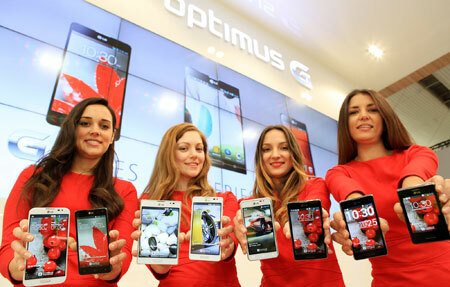 The MWC will be an important opportunity for LG to judge initial reactions from an international audience. The electronics maker has said it is looking to move 10 million of its flagship Optimus G series and positive reviews will be imperative for its long-term marketing plan. The previously launched Optimus Vu and Optimus Vu II tablets and up to 80 budget and mid-ranged phones will be displayed at the company’s booth in Hall 1. In a statement LG highlighted user experience for its phones, especially its multitasking Q-slide feature on smartphones, and a large amount of long-term evolution (LTE) patents. “We will put our best-quality displays, LTE core technology and creative user experience as our main competitiveness to expand in the global smartphone market,” said LG mobile chief Park Jong-seok.